Confluence organizes its content in spaces. Questions recognizes that some content should be available anywhere - so questions can be created outside spaces and organized just by topic, or asked inside a space, to inherit space permissions and keep things together. If you have permissions to use Questions, you will see a 'Questions' item on the Confluence header, and questions will appear in your search results. One way to encourage users to use questions is to display them on pages using the Questions List macro. 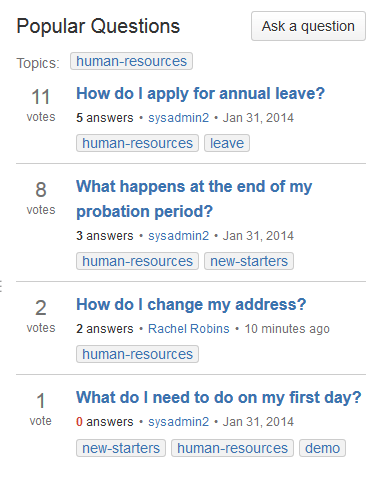 For example, if you use Confluence as your intranet you might include the 5 most popular questions with the topic 'human-resources' on pages for new starters in your team. In the editor, choose Insert > Other Macro. Enter the number of questions to display. Select a filter - you can choose to show recent, popular or unanswered questions. Enter topics - you can choose to match all or any of the topics you enter. Choose a Space - leave this blank if you want to show all questions. Include an Ask Button if you would like users to be able to ask a question from your page. The macro will show all matching questions (including questions asked in any spaces that you have permission to view). Some of your existing Confluence macros can be used with Questions. You can find out more about using macros in the Confluence documentation. The Create from Template macro can be used to add an 'Ask a Question' button to any Confluence page. Enter the Button text, for example 'Ask a Question'. Select Ask a Question from the Template Name drop down. Skip the Title and Space Key fields - these only apply for page templates. Your new Ask a Question button will take you to the same place as choosing Create > Ask a question. Enter the topic or topics that you want displayed in the Labels field. Leave the Include this Content Type Only field blank. All content, including questions, pages and blogs that contain the topics specified will appear in the list.